Windows Debugging Tools: GFlags: Beware 32 vs. 64 bit! If you’ve ever tried (as I was trying this week) to debug a loader problem on Windows, you probably know about the very useful gflags application. 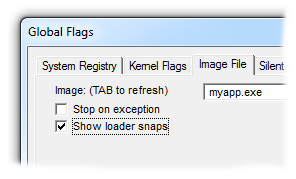 It’s part of the Debugging Tools for Windows, and one of the things it does is enables “loader snaps” for a process. That tells the Windows loader to send a whole bunch of useful information to the debugger console as it loads an executable and its DLLs. Except that it doesn’t. Not if you’re running on 64 bit Windows, developing a 32 bit application. If you just follow the obvious download links for the Debugging Tools you’ll get the 64 bit version, which will quietly ignore your request for loader snaps for your 32-bit application. To set the appropriate flags you’ll need to install the 32-bit Debugging Tools and use that version of gflags.